Lesson 12 in Paul Krugman's Masterclass is 7 minutes and 29 seconds long. 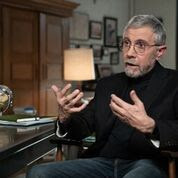 In this lesson, Krugman hits it out of the park with sound arguments. Krugman discusses automation and why the loss of specific jobs because of automation doesn't mean it damages the economy but in fact results in greater overall productivity. I suspect Krugman resorts to sound economics here because it is a way to attack President Trump who champions protectionist measures to "bring back manufacturing jobs." But whatever the reason, he is thoroughly sound in this lesson, pointing out that we were once an agricultural nation, where most were employed in agriculture, then a manufacturing nation, where the jobs went, and now automation is eliminating many manufacturing jobs so that the jobs now are in services, including in healthcare and entertainment. He calls it "economic evolution" and he is correct. My one minor quibble with Krugman is that he says that those who lose jobs because of automation are "harmed" whereas I would argue that their job opportunities have just shifted. He is right "jobs are going to disappear." But then smartly uses a construct of an economy that is composed of just hot dogs and hot dog buns. If a way is found to automate hot dog making, he argues, then that means that there will be fewer jobs for hot dog makers but more jobs for hot dog bun makers. And then he points out that if automation increases both hot dog production and hot dog bun making, the economy is better off because there are more hot dogs and hot dog buns, he leaves off that this frees up workers to create other things but it is implied. This is by far Krugman's best lesson and I give him an A for this one. The problem wrt automation is that government blocks people from shifting. The government creates laws, regulation, and so forth to protect the big players from competition and disruption. Then the big players automate. Then there is a lack of new things for people to do instead. Even when it is a shift to some business sector that government is feeding like medical care a person is met with all sorts of imposed barriers like licensing, certificates, and so on. It's as if there is an economy of hot dogs and buns and Italian beef sandwiches are illegal while making hamburgers requires a special license and all sandwiches have to be approved by the government before being offered for sale. If anyone needed a reminder that psychopaths shall inherit the earth, let him read these reviews of a charlatan's "master class". How much money are gullible twits paying to get this twaddle? The virtuous genius Henry Hazlitt refuted all this nonsense in his pellucid and logical prose decades ago, and I'm sure he didn't die as rich as the economic charlatans do or will. Furthermore, Hazlitt to my recollection also remarked that economic innovation benefits everyone in the long run, but can certainly damage some people in the short run. Or in the case of individual lives, can damage some people permanently. But as Hazlitt understood that's not an sound argument for Luddism.